Whether for work or pleasure, taking the train as your mode of transportation is relatively inexpensive, faster than driving, avoids traffic hassles, and allows passengers to get more work done in comparison to flying. In general, Amtrak is an excellent option for business travelers in the Northeast (and other areas, depending on your trip plans). But before you embark, it's important to understand what types of baggage Amtrak allows you to board a train with. Many Amtrak routes (like the Northeast routes) lack baggage services, so you need to be prepared to board the train and exit with your own bags. Amtrak baggage requirements allow passengers to carry on 2 bags. Bags cannot weigh more than 50 pounds, or be larger than 28” x 22” x 14” inches. In addition to the two carry-on bags, passengers are allowed to bring small items that do not count toward their carry-on total. Small items include things such as medical devices, pillows and blankets, coats, coolers, purses and small bags, and electronic devices. Carry-on baggage must be stowed either overhead or under the seat in front of you (standard Amtrak trains usually have rather large overhead areas for storing luggage). The Acela Express trains also have overhead compartments with a closeable door, which are slightly smaller but larger than many airline overheads. Usually, there are also baggage storage options at the end of some of the cars. Keep in mind that just like anywhere else, it's a good idea to keep an eye on your luggage while you're on the train to make sure your bag isn't stolen or rifled through. If you get up to go to the cafe car, take a stroll, or go to the bathroom, make sure to take your valuables with you unless you have someone to watch them. A good tip is put all your valuables, electronics, travel documents, and any medicines you're traveling with in a messenger bag or backpack and take it with you when you get up to move about the train. Amtrak does offer checked baggage services on some routes and some stations, but you must check their website to make sure that the stations you're using provide checked baggage services. If they do, you may check two bags for free, and up to two additional ones for $20 each. Again, the bags can't be heavier than 50 pounds or greater than 75 total inches (length + width + height). Oversized baggage (that means anything from 76 to 100 linear inches) is also $20 extra each. Amtrak requires that checked baggage be checked forty-five minutes prior to departure. 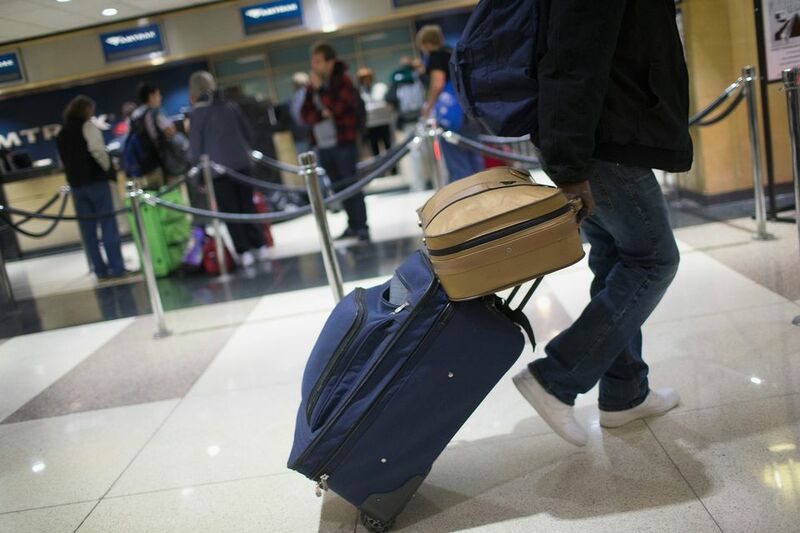 Also, be aware that if your travel plans include an en-route transfer, you need to allow at least two hours of scheduled layover time to accommodate for the transfer of your checked baggage. Some train passengers may have special requirements due to disabilities or medical conditions. Amtrak does make some allowances for these situations. For example, standard wheelchairs, scooters, oxygen equipment, canes, and walkers are allowed but do count as one of your carry-on items. However, such devices do not count toward your carry-on or baggage requirements if you have booked a mobility impaired fare. In addition, if you have any special requirements, it's important to check with Amtrak directly to confirm the specific details and baggage requirements and allowances as they apply to your situation.